During my trip last week to Rongshui County, I was able to observe and photograph some aging but still very elegant women in a small Miao village. Robert Lio, his wife Xiao and I, along with Xiao’s cousin (he drove) made our way to this particular village because it was supposed to be “authentic”. An out of the way place that didn’t usually cater to tourists. It was indeed out of the way, and while they weren’t set up for it, they did actually cater to us pretty well. Only one problem. There was hardly anybody there! As it turned out, a baby had been born and most of the village had made their way into town (no small feat) to see the baby. As is often the case, it was probably better the way it turned out, more intimate somehow. A precocious ten year old served as our guide, his young uncle made lunch, and there were all these old gals who came around and sat down to watch us eat. The light was low, creating a lot of good shadows and I noticed the hands of these two women in particular. They sat perfectly still during the entire meal, never saying a word. Even as I raised the camera, fooling around for what seemed like an eternity trying to get the exposure right, even then, they didn’t flinch. 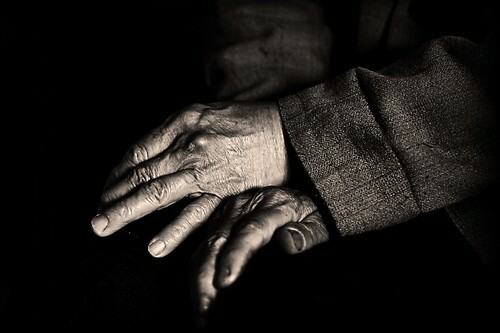 When I got home and began to process the photos I was struck by how extreme the hands were. What I mean is, that while they are clearly weathered and worn from years of hardship, they were still somehow very beautiful to me. When I look closely, I still see the hands of young Miao beauties with all the dreams of their youth intact. So, I’ll be away for a day or two I think, returning to school and the students and well, work. I’ll have more on the trip to Rongshui soon, it was an interesting day. As a precursor, I can NOT recommend the home-made Miao moonshine rice wine. ~ by Expatriate Games on April 29, 2009. You do some amazing work accenting and drawing out color in your photos, but I also love the contrast you bring out in photos like this with an absence of color. That top photo, its like she is reaching out to grab your hand, guiding the viewer to sit down and get comfortable, and hear the long story of her life. Good stuff man. Great shots, Michael. How could you not like the jiu? A beverage and paint thinner: What could be better? Brother, I didn’t partake. Bob however, well let’s just saying he was feeling the effects later that afternoon! I’ll write more about it next time. I am well aware of that “feeling.” Best avoided more than once or twice a year. 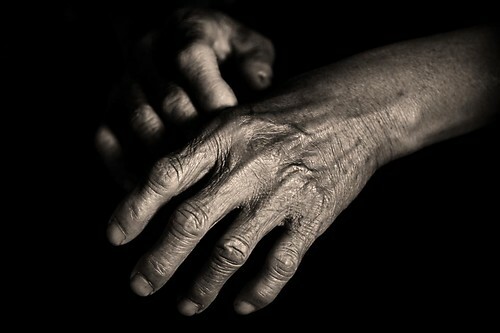 Hands make great subjects. That first shot is a winner – great details, sharpness and tone. I am in love with all your photographs, if only I am half as talented. Simmy, you are so kind to say that, but the truth is I don’t hold a candle to you my friend. Nice to see you here, hope all is well over there. Have just come across your blog through your great photos on Flickr and I have to say this is one of the nicest looking blogs I have seen in a long long time. I look forward to reading it anf hope you’re in China for a while to come! Very kind of you David, I hope I am here for a while as well. Let me know when you make your next trip!